This is a raw image of the storm found at the center of Saturn’s hexagonal feature located at it’s northern pole (see below). Be sure to click on it for the high-res. The image is going to be “officially released” soon, but I don’t know how much better it can get than this. One of the exciting things about this storm is the depth that we are allowed to see into Saturn. There is no other feature on Saturn that allows us to see any further than the cloud tops. This is the best image of the mission with Saturn and Titan together in one shot. Only a true lover of planetary exploration can get excited about an image like this. Titan is definitely one of the most exciting places in the solar system despite it’s almost total lack of discernible details either surface or in cloud structure. So like Uranus and Venus most images of these locales look something like smooth monochromatic tennis balls without the white lines. Above is a color image of the vortex in more detail. Scientists are still unsure of the process that causes this to occur. 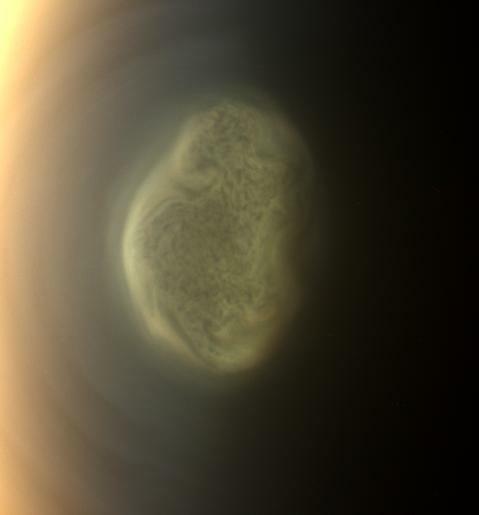 However, similar phenomenon have been seen before — most notably on Titan’s parent planet, Saturn. Haven’t come across too much lately. When that happens, I like to post these images that have been sitting around collecting virtual dust. Cloud top formations on Saturn taken by Cassini in 2009.